If you have read Moneyball, or seen the film, you’ll remember that Oakland A’s GM, Billy Beane, is faced with the dilemma of replacing some star players with some cheaper options. He’s hamstrung by a kind of salary cap, a kind of stingy owner. He is forced to try and buy runs rather than players. Figure you win 100 games because you scored “x” amount of runs. So his goal is to replace the runs vacated by those star players with potential runs for a fraction of the price, in order to score enough runs throughout the season to have the best chance at winning the same amount of games again. Obviously for the baseball fans, it goes much deeper than that. It’s a stretch, I know. Comparing baseball to football is often apples to oranges. But check out what the Ravens have done this offseason, replacing many positions on the defense. Positions vacated by young stars on the rise in Paul Kruger and Dannell Ellerbee, and older veterans like Ray Lewis, Ed Reed, Ma’ake Kemoeatu and Bernard Pollard. 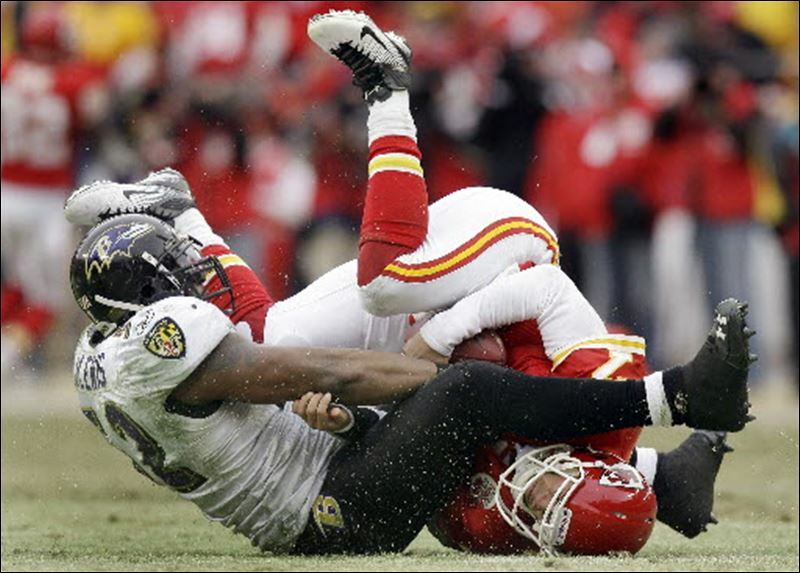 Today’s focus is on pass rushing, where the Ravens ranked 13th in the NFL in sacks in 2012. But cumulatively (hits, hurries, all things considered) the Ravens ranked 25th in the NFL. Below are guys who make up a starting 11 defense from 2012. For the purpose of this list, they are starting in order of the amount of pass rushing attempts they made from the common 3-4 positions. Also, next to each player is their 16-game average, as some guys missed a couple games or more due to injury, or played minimally in the week 17 matchup with Cincinnati. Six players are gone from this list. Five if for the purpose of this exercise, you consider Ed Reed didn’t contribute to rushing the passer. That is 101 pressures including 23 sacks, 25 hits, and 53 hurries that the Ravens are looking to replace and add on to. Now we take a look at what kind of production this year’s starting defense could produce. This list is also compiled with last season’s 16-game average stats, with two exceptions. For Daryl Smith and Michael Huff, I used 2011 numbers, as Smith missed all but two games in 2012, and Huff was a safety rather than a corner in 2011. It’s as if the potential for 2013 is identical to the actual production of the year before. Not to mention the added depth of Marcus Spears, Brandon Williams, and John Simon to share time along with returning players, Pernell McPhee and Courtney Upshaw. We also haven’t seen what rookies Arthur Brown and Matt Elam are going to bring to the table as likely starters right out of the gate. The six players not returning from last year’s starting defense would have cost the Ravens $19.73 million against the cap (current earnings and last year’s cap number for Lewis and Kemoeatu). Five of the six new guys expected to start on defense are costing the Ravens just $7.13 million against the cap. Matt Elam has yet to sign. Even when he does, the overall savings versus production will get that much better for 2013.